In my role with the Stateless Man, name-calling against me seems to be par for the course. Recently, for example, someone emailed and called me a “Capital Communist.” “Cultural Marxist” is also a regular favorite with my detractors. As you can gauge, given that I advocate against collectivism, any connection with reality is beside the point when it comes to these character attacks. All I can say is good luck to those people, since any fruitful engagement appears out of the question. There is one criticism, however, that is more widespread and merits a response. It is that I and other people who do not give allegiance to nationality are “unpatriotic” (or selfish). We do not appreciate the support that people in government in our native countries have given to us and are disloyal. Going by that use of the term, I am guilty as charged. I do not appreciate what government officials have done to me, and I’m not loyal to them. Far from having provided support, they have stolen from me and have sought to control my life in countless ways. Now they have the audacity to claim they have done me a favor and expect my allegiance. Please, pull the other one. A particularly sore point is the many wasted and unpleasant years in government schooling, which only got in the way of my education. As noted in my article, “Books That Have Changed My Life,” not a single book from my elementary and high school years was of sufficient interest to make my top ten list. In fact, after fourteen years of schooling in New Zealand, including one year at university, my writing was so poor that assessors at Boston University thought I must have been a non-native speaker. “Uh, we speak English in New Zealand,” I told them. 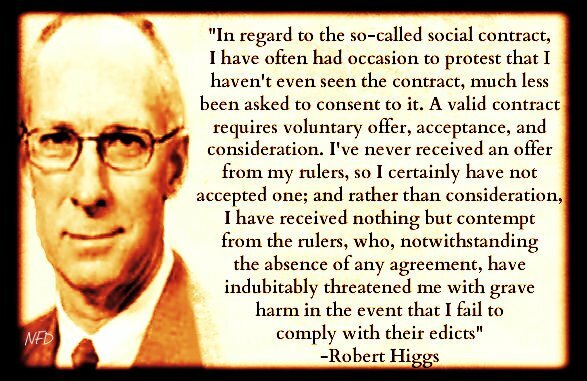 Not only do the social contract and fair play arguments for political obedience and allegiance not hold water, acceptance of them has led to immensely destructive outcomes. A recent article from Jacob Hornberger, “Who Were the Patriots and Traitors in Nazi Germany?” tells the sad tale. The good citizen — the one who deferred to authority — was considered the patriot. In the case of the United States, the founding document, the Declaration of Independence, does coincide with this idea. In so far as patriotism means support for and a life consistent with this ideal, then I will gladly endorse it. Let us not forget, however, that this American ideal is not the sole property of a geographical region, which has changed markedly since then anyway. Additionally, its existence on paper does not guarantee existence in reality, and freedom is in a sorry state in the United States. Great article Fergus. Well said-resonates strongly. I get called a Marxist all the time because I have a slightly liberal slant on a few issues that have to do with social justice. It doesn’t matter that I don’t think the federal government shouldn’t play a part in social justice except in extreme widespread disasters like a large hurricane or earthquake but for nothing else. I do believe that we need a social safety net on a state and local level but only temporarily. No one should need help for more than a few months to a year. Old people, “challenged” people, and children are the exception. Those without family need help. It’s inhuman to just abandon these people. I also think the state is the best way to build and keep up infrastructure. I do not believe in a stateless society or a stateless man but I do believe in a very tiny, unobtrusive, nearly powerless state. @Jeanne LeMaire Romero That makes you a Minarchist. But the problem that all minarchists can’t seem to put behind them is that a state, by its’ very nature, ALWAYS GROWS. This is just the nature of mankind, and was demonstrated excellently by the USA, having been the smallest government ever known to date. I gave up on minarchy long ago; It’s a pure Utopian fantasy, unless your lifespan is measured on 2 hands or less. RandallSmith42 You can only “give up” on it if you live in your own Utopian fantasy of everyone for themselves. This truly is without compassion for anyone but yourself. In which case, I vote for you living on Hudson Bay, fending for yourself. The problem that many anarchists who genuinely wish for anarchy as a reality can’t seem to put behind them is that peaceful anarchy achieved voluntarily as a realistic goal is minimally tied to a very long timetable. There is practically no road from here to anarchy anywhere on this planet that does not involve very very very long timeframes to realize. No society is anywhere near a point of evolution where enough individuals will voluntarily treat others in a way that is required, or to least generate enough effective social pressure to encourage those that wouldn’t otherwise to “do the right thing”. Until (if we ever do) we evolve as a society to the point of not needing a state, there has to be a solution for *right now*. “Minarchy” is at least a more rational shorter term goal. Any of us wanting anarchy have to come to grips with a concept of two or more goals: a desired ideal (peaceful anarchy) with a long path to get there, and intermediate goals that get us successively closer. Hey mate FoodRiotRadio I suspect, given the education angle, you share similar sentiments. People who call humans something other than human are lying. I’m glad you wrote this. The topic of Patriotism seems to be a reoccurring theme across the board with outspoken individuals. Ron Paul has recently talked about it, as has Snowden, Tom Woods, Peter Schiff, and the list continues. I think that many, on the side of freedom of thought and access to true peace and liberty, have been labelled all things but a patriot. Being a patriot involves taking risks to disagree with the establishment and provide discussion and truth to the people. In its most basic sense, a patriot is always for the people and human rights regardless of borders and governments. Despite modern definitions (which we all know have incorrectly been changed over time) a patriot is not one who protects his “nation’s” borders, but one who fights to preserve the rights and the freedoms of all mankind, not just the politically well connected. I consider you quite the patriot, and that is why I continue to listen to your discussions and enjoy the explorations of your site. Keep up the good fight, we’re here with you.